Anya of Winterbourne had suffered nothing but humiliation at the hands of men. And yet when she found a fallen knight in a still winter forest, she could not leave him to die. Weary of battle and pursued by assassins, Christian de Moreerx would have liked nothing more than to stay at Winterbourne and champion the elusive and beleaguered Lady Anya. But his past contained a secret he had to decipher if he was to live, and his presence could only bring more disaster to the manor. Christian caught her hand. “You are forgetting again, my lady,” he said with a mocking tone. A teasing smile curved his rich mouth, and Anya remembered with a sudden shock just how that mouth had felt against her own. A bloom of awareness touched her. “What thanks do you wish?” she asked softly. Anya chuckled, but did as he asked. “There.” She looked up to find him staring down with a very different sort of expression on his face. Thick rain, cold and bitter, poured from a dark winter sky. Four men rode through the dankness, heads down in miserable silence. A fifth man was flung over the body of a mule. Blood stained his hair. Rain wet the battered face. As this new woe penetrated, he groaned softly, but the others did not pause. Steadily, though it was Sext, the day darkened. Jean-Luc de Ventoux, till late a farmer’s fourth son and not yet seventeen summers, cast a wary look at the sky. An evil portent, that blackening sky—a dire warning to halt their evil. But he growled the words to himself, fearful of raising the ire of the others again. They had laughed at his misgivings when they found the knight alone in the still of a cold evening, feeding carrots to a mule. Jean-Luc had quelled his nerves and joined in the ambush with vigor. It was Jean-Luc, he thought proudly, who’d delivered the silent powerful blow to the head that laid the knight low. But even as the knight had fallen, a beast roared out of the woods, yellow eyes unholy as it leapt upon them with fierce, low growls, madly tearing at their clothes, so violent it took several long moments for anyone to react. One of the kidnappers suffered a long rent to his leg, and they lost another to a torn throat before Claude, their leader, kicked the beast squarely in the chest. It made a high-pitched yelp of pain as it flew, and landed in the grass of the meadow. There it lay, unmoving, tongue lolling. By then, the marauders feared discovery by the soldiers camped not far distant, and bundled the body of the knight to the mule to make their escape. Claude wore the knight’s sword hanging from his belt. Now the sky darkened, more and more, ominously. Jean-Luc heard a snapping in the woods and peered nervously into the trees, unable to quell a finger of dread. He saw nothing. The rain ceased, but still the sky did not lighten. Jean-Luc glanced uneasily toward the knight. There had been two men willing to pay richly for this man—one to have him dead, another to be borne back to France in secret. He was at the heart of some plot. Jean-Luc wondered what it might be. The knot of horses lifted their heads restively as the stallion snorted and danced almost out of control. As if in reaction, from the woods came a high, mournful howl. The sound traveled around the knot of men and horses. At first there was only the one howl, joined by another, then another and another, until they were surrounded with the eerie noise, echoing and bouncing, circling them. The stallion snorted, eyes wild. In terror, Jean-Luc looked back to the knight, and it seemed the golden hair glowed with some inner light. Ropes about his wrists had made a chafed mark. And with a certain horror, Jean-Luc saw that only the mule was calm as the other animals danced and skittered in response to the stallion’s fear. A great bolt of lightning cracked through the darkness and struck a tree nearby with a booming explosion. The stallion reared and screamed in wild terror, then bolted through the forest in a frenzy. The other horses followed. Jean-Luc clung to his mount as the creature crashed without grace through thick trees. 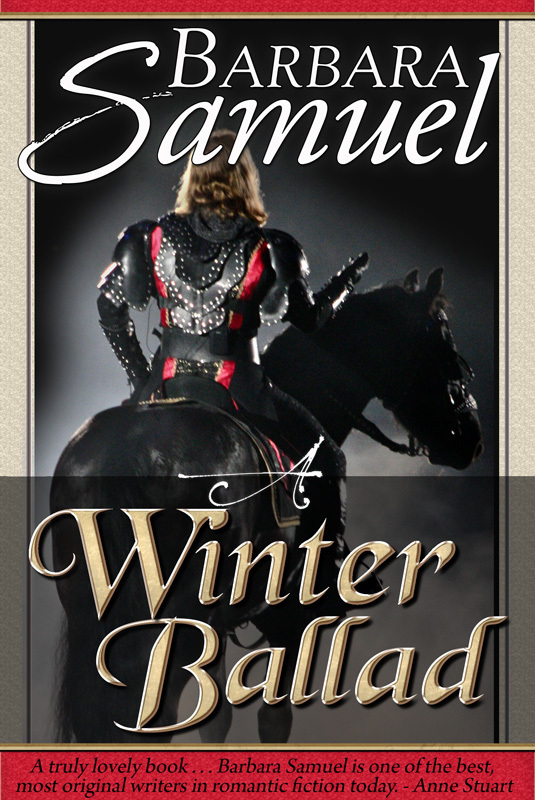 He kept his head low to the horse’s neck, his fingers woven through the mane. Around them was the wild pounding of the horses through dense forest and the wolves baying—surely the sound of hell, Jean-Luc thought in terror. It began to rain again, hard. Lightning flashed in the evil daytime darkness, and thunder boomed with a rocking violence. Jean-Luc’s horse suddenly reared. He clung mightily, hearing a shout and a sudden, quick cry of pain amid the cacophony. Through the rain, Jean-Luc saw Claude had been thrown from the stallion, who bolted away through the trees. Furious, Claude jumped to his feet, brushing his clothes and cursing as he pointed after the beast, sending one of his men after it. In the confusion, Jean-Luc saw his chance. Nickering gently at his mount to calm the beast, he steered the gelding from the pack and retraced their steps as well as he was able. The mule had not followed the wild bolt through the forest, but Jean-Luc found him calmly standing under the sheltering arms of an ancient rowan tree, as if to protect its rider. Glancing over his shoulder, Jean-Luc dismounted, and with a grunt, pulled the dead weight of the knight from the beast. The man slumped on the ground, rolling to one side with a stuporous moan. He did not wake. He jumped to his feet—and at that moment, the sky lightened abruptly. Stunned, he looked toward the brightness, letting the rain wet his face before he fell to one knee and genuflected. Taking the rope around the mule’s neck, Jean-Luc mounted his horse and led the mule away. As he rode toward the others, an extraordinary calm filled him. Purses and heads were nothing in comparison to an immortal soul. It was that thought that lent him courage to lead the men in circles, far from the sheltering branches of the rowan tree, when they went back in search of the knight. Defeated, weary, and not a little frightened by the afternoon’s events, the men at last headed home toward Provence, leaving the body of the knight where it lay. The body sprawled beneath the bare branches of a rowan tree. In the thick fog that laced through the trees and clung to the cold winter earth, it was invisible until Anya’s black gelding shied and whinnied softly. “I cannot tell.” Anya dismounted and tossed back her hood. Warily, she crept forward, listening cautiously to the deep silence of the forest. There seemed to be no one else about. The horses stood quietly. Anya eased closer, noting the quality of the knight’s mail and the good condition of his hauberk. Any helm he might have worn was gone, and his head had suffered the loss. Blood, thickened by cold or time, clotted his hair. Kneeling beside him, she examined him for signs of life, her hands clutched close in her lap. Tangled long hair the color of ripe wheat covered his face, and below the heavy leather on his chest, she could see no movement. “Is he dead?” Geoffrey whispered loudly from his mount. Anya lifted her shoulders, for it was impossible to know. Bracing herself for the eerie feel of dead flesh, she reached out to touch his hand. It was cold and marred with chilblains, but not dead-flesh cold. Nor stiff, either. Heartened, she reached forward to brush the hair from his face. He moaned and shifted a little. Anya started and jumped back a pace, shooting an alarmed glance toward Geoffrey. “See if he is armed before he awakens!” the boy urged. The knight moved no more, and Anya bent to check his sleeves for daggers. No belt or scabbard hung around his waist, though a shiny place on his hauberk showed where it would go. The small shift of the knight had put him flat on his back, and now she could see his face. Blonds were often pallid and delicate. This wounded knight was neither. His flesh was tanned, the sharp cheekbones a touch sun- or wind-burned. A high brow and the straight clean lines of nose and jaw bespoke intelligence. His mouth, in his stupor, seemed peculiarly vulnerable. She knelt again, no longer afraid, and probed his body for signs of injury. There were bruises along one side of his face, and the bloody cut on his head. One shoulder seemed cocked at an odd angle, but it was impossible to see what sort of injury made it so beneath the mail. When she pressed along his sides, he made no sound of pain. With both hands, she checked for breaks in his limbs. None. The page stared at her. Between the two of them, they managed to drag and half lift, half throw the man over the back of Anya’s mare. He groaned again, a low, agonized sound, but did not waken. Anya frowned. It would have been better had he roused. She held little hope for his life. Once he was settled, Anya took the reins to lead her mare back to the castle. Anya whirled, heart pounding, to look for bandits. She saw nothing. “Geoffrey,” she said sharply in reproof. The boy pointed toward the spot from which they’d lifted the man. A lean, ragged dog skulked close to the place, his tail down. He sniffed the area and whined. The creature looked as if it feared beating, but even the fear did not keep it from edging closer to the man on the horse. It whined again, a sorrowful sound. For once, perhaps because he felt sheepish over his myriad fears, the boy did not argue. They made their way through the forest back to the Hall. At the gates, there was a stir over the wounded knight, but unlike Geoffrey, the men-at-arms did not argue with the lady of the manor. Female she might be, and ruined besides, but they recognized her authority. In the continued absence of her brothers, one on a pilgrimage to the Holy Land, another a canon at the cathedral in Lichfield, Anya was the only clear mistress they had. For five years, she had run the manor ably—far better, she knew, than her brother, who’d nearly ruined the fief in his sorrowing and drunken haze. The men carried the knight to a chamber behind the Great Hall, close to the hearth, where it was warm and dry. They settled him on a straw mattress, then stood waiting. Anya dismissed them, except Geoffrey, whom she sent to the kitchens for the supplies she needed. The dog crept in, head down, and when Anya didn’t shout at him, slunk close to the knight’s feet. “I fear your master has little time left to him,” she said as she began to remove the hauberk and mail, gently as she was able. The knight groaned softly, shifting away from her hands. His flesh burned with fever, and Anya could smell the sour odor of illness about him. A maidservant appeared with a bucket of water and strips of cloth. She set them beside Anya with a grunt, and her attention fell to the knight, naked on the straw mattress. A quiet murmur of surprise and pleasure escaped her mouth. Left alone, Anya dipped her cloth in the warm water and began to wash the sweat and heat from the knight’s body. First his face, so bruised and battered. One eye was swollen and a gash marked his jaw. She paused to look at the wound, but found it mending already beneath the caked blood. His lips were cracked, too, as if from thirst. He must have lain in the forest, wounded this way, for at least a day and a night. Her estimate of his chances of survival plummeted again. The head wound was deep and oozed with a muckish substance, but even it was not the worst of his injuries. She had prayed the shoulder had only slipped from its joint. Once she removed the mail, it was plain the bone above his chest was broken, and a great red bruise marked the place, as if he’d been given a blow. Puzzled, she examined him more closely. Bruises marked him head to toe, darkest around his hips and legs. It seemed he had been beaten fiercely. Perhaps he’d been set upon by the bandits who owned the forest? At his wrists, raw red rings marred the flesh—the marks of binding. One finger was swollen at the joint, and when she probed it, she found another small break. There was no lack of strangers on the road to Lichfield, for pilgrims and knights and monks traveled the road daily. But few ventured from the road to the forest, and none ever came so far as the village of Winterbourne unless by intent. The beast whined and, tail down, crossed the floor. Gently, Anya stroked him, feeling the long sinews of his body below oily gray-and-black fur. Her hand grazed a lump on his side, and the dog yelped, turning to nearly bite her. He stopped short of it, licking her wrist instead. Anya called Mary, her most trusted servant, covering the knight with a fur before the woman came into the chamber. Mary scurried out. No doubt she would whisper this new story in the kitchen, to add to the others that made Anya’s defiance of the church infamous. It mattered not. There were so many now, her fate was sealed. The priest himself had damned her—what more could the servants do? Christian drifted. In his dreams, he stood at the mouth of hell, his skin blistered by the heat. Beyond, standing unharmed in the flames, the Beast laughed at his folly, and Christian tried to protest that he was the wronged; that it should be his father, not he, who should be burning here. Hell shifted, became a cold battlefield, and he was dying of thirst. An animal chewed his body. He screamed, but it did not stop. Then he was walking somehow, and each step shot agony through him, but he could not find his dog. In his dream, he cried out, “Ysengrin!” and at last, the dog appeared, licking his fingers. He had no idea how long he had thrashed and wandered, but it was Ysengrin’s tongue that roused him slowly. He came awake by pieces, to a dizzy sort of awareness. He lay in a bed, warm with furs and the heat of a wall nearby. Flickering candles winked in the dimness. Christian could see little; his head thundered, and his shoulder burned as if there were still creatures tearing at it with their strong teeth. In a chair nearby the bed was a woman, slumped beneath another fur. Who are you? he wanted to ask. How came I to be here? He had been so sure he would die at the hands of the bandits. But his lips cracked when he moved them, and all that came from his throat was a dry croak that sounded not of words at all. It was enough to rouse the woman. She came awake instantly, tossing away the fur to stand up and take his hand. She touched his head, and his cheek, and reached for a cup. “A little water?” she said. He found he could not even nod, but it was not necessary. She cradled his head against her breast and lifted the cup to his mouth. The liquid flowed over his parched lips and tongue like a magic potion, silvery and cold. Greedily, he gulped, closing his eyes to taste it more deeply. Before he finished, she took it away, and he wanted to shout at her to give it back. As if she sensed his frustration, she murmured something soothing, and her voice was deep and strangely settling. Her breast made a plush cradle for his aching head, and her cool hands smoothed the heat from his cheeks. He thought she sang, but oblivion came to him too quickly to be sure. The knight hung at death’s door for several days. Between other tasks, Anya kept watch over him, patiently feeding him ale and broth and water, mere drops at a time. In the morning, and again at night, she washed him with cool water, head to toe, to break the fever that still raged wildly; then pressed cloths soaked in wine and rosemary to his bruises. She accepted no help with the task, and could not say why. It seemed the strange, broken knight was her own atonement, a silent penance she performed. As each day took him further from the mouth of death, she began to revere the moments she spent tending him, and let nothing interfere with the intimate tasks. He was long and golden, with strength in his arms and legs, and perfect symmetry in each thing—his feet were as beautifully made as his brow. Candlelight gilded the hair on his chest and legs until he seemed to glow like a god from another world. She had never wanted a man, not any of them. And she told herself she admired this one only because he was purely under her control. He was weak as a babe, and needed her, as any of the helpless creatures of the fief might. But it was a lie even as she thought it. Not even burning with fever was he helpless or weak. Even in the deepest stupor, he exuded a strange dormant power. Sometimes she found herself sitting for long, uncounted minutes, simply staring at him. In those lost minutes, she felt awash with a queer sense of her own body, arrayed around her, made of flesh and bones and empty limbs. Then some sound would bring her again to herself, only Anya of Winterbourne. Appalled at her yearning, she bustled away, afraid some might observe her covetous glances and make sport of her wish to have that which would be forever denied. By the fifth day, he seemed on the mend. Anya left Geoffrey with him and went about her chores. The accounts had to be watched carefully, for the wars and floods and miasmatic winds had given them all poor harvests this year. Not only Winterbourne suffered, either. All her brother’s holdings were strained. If the villages and manors were to survive, they could tolerate no waste. She was weary with keeping watch, a weariness she felt in her neck and grainy eyes. Twice, while recording the day’s expenditures, she yawned mightily. She gestured for him to join her. Behind her in the hearth, a fire burned and crackled, smelling of pine. A multicolored young cat scattered rushes playfully, digging below them in fierce delight. Anya chuckled and scooped Esmerelda into her lap, taking a small pleasure in the tiny bones and body against her hand. The cat kneaded her kirtle, purring. “Is there news of my brothers?” she asked. “Aye, my lady.” He stood, but made no move to go. Dropping her quill, Anya leapt to her feet and hurried after him.